The Ancient Andean Tradition of Eating Clay May Have Helped To Protect Health : The Salt Farmers in Peru's Andean highlands have been consuming clay for centuries. Scientists now think it may have allowed them to eat wild potatoes, which are rich in toxic chemicals. A bowl of chaco clay at a home in Peru's Puno region. People usually eat this clay sauce with potatoes, especially during the potato harvest season. Talking about clay makes Amilcar Apaza nostalgic for his childhood in Juliaca, Peru, a city in the Andean highlands. He remembers gathering with his family in his grandmother's fields in the nearby countryside for the potato harvest. There, they would build a small oven to cook the fresh potatoes and eat them, dipping the potatoes in a sauce made of clay, water and salt. "The flavor is like a creamy milk, very thick and salty," says Apaza, who now lives in Lima. During harvest time, the clay sauce is eaten nearly everywhere in the altiplano or high plateau region, he adds. The type of clay that Apaza ate is known as chaco in Quechua or pasa in Aymara, two native Andean languages. Edible clay is collected from several main deposits in the altiplano. While the exact composition varies depending on where the clay was unearthed, it is normally rich in certain minerals called smectites. While there are many theories about the origins of clay eating, scientists now think this unusual culinary tradition may have served a protective purpose. 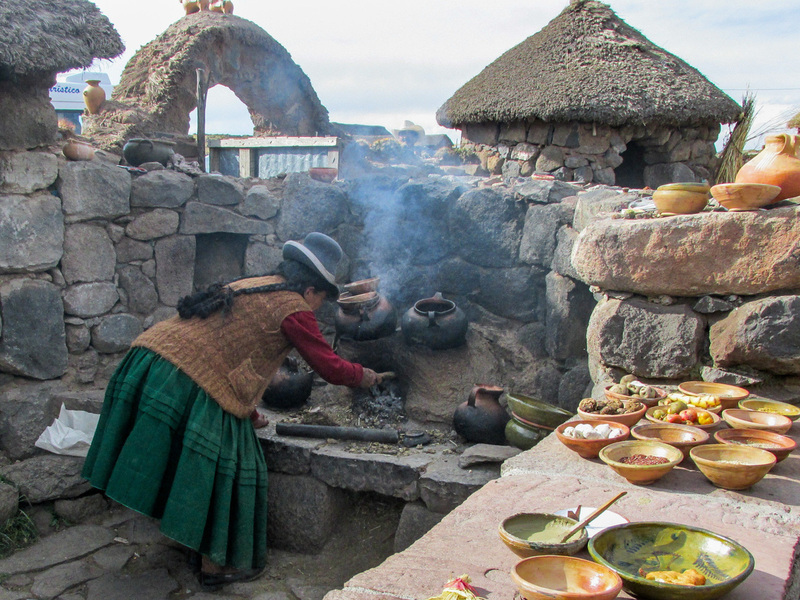 A Quechua woman tends to her clay oven in her outdoor kitchen on the road to the Sillustani archaeological site in Puno, Peru. The stone table is laid with a collection of potatoes and other tubers, as well as homemade cheese and bread. The practice dates back to pre-Columbian times. Scientists have found bits of what looks like edible clay — with the same minerals as clay consumed in these regions today — in a broken pot in a temple in Chiripa, Bolivia, suggesting the practice is at least 2,500 years old. "The consumption of clay is ancestral," says Peruvian agronomist Alberto Salas. And, he says, clay may have allowed early inhabitants of the Andes to eat wild potatoes, which are toxic. Known as "el padrino de la papa," the potato godfather, Salas has traversed the Andes Mountains in search of wild varieties of potato for the last half century. He hypothesizes that early Andean inhabitants may have copied clay-eating parrots in the Colorado clay lick in southeastern Peru or other clay-eating animals, such as wild vicunas and guanacos, relatives of the llama. But the practice probably took off because it protected humans from toxins in potatoes, Salas says. Wild potatoes naturally contain higher levels of toxins called glycoalkaloids, he says. Low levels of glycoalkaloids can cause gastrointestinal discomfort such as abdominal pain, diarrhea and vomiting. Higher doses can lead to severe symptoms like paralysis, and in extreme cases, death. There is preliminary evidence that clays from Andean highlands can detoxify potatoes by absorbing their toxic chemicals, explains Timothy Johns, a professor of human nutrition at McGill University. Johns himself analyzed the binding properties of several Andean clay types back in the 1980s and found that when put in a test tube along with tomatine (a glycoalkaloid found in tomatoes that is similar to the toxins in potatoes), the negatively charged clay particles stick to the positively charged toxins. More recently, a study published in 2012 found that a mineral found in some of the Andean clays significantly reduced the naturally occurring toxins in potatoes. Johns thinks that as clay particles stick to the toxic glycoalkaloids in potatoes, they remove the bitter taste and prevent the toxins from entering the bloodstream. "If you are chewing them up together, that process will start immediately," says Johns. The clay particles and toxins are probably then ferried out of the body in feces, he suggests. In John's experience, the potatoes are barely palatable without the clay. "But they are not so toxic that they are going to do you harm if you eat one potato," he says. "You'd really have to eat a lot." Modern day breeding has led to many non-toxic potato varieties. But the first domesticated ones were probably toxic, like the wild varieties, says Johns. Salas agrees. Clay eating "surely came from the first epochs of the domestication of the potato," he says. In one of the first written documentations of eating clay and potatoes, Spanish priest Bernabé Cobo, who arrived in Peru in 1599, wrote in his book Historia del Nuevo Mundo, that the Peruvians ate potatoes and other roots with a clay sauce, "moistening them in this mud as if it were mustard." Bitter potato varieties are still harvested in the Andean highlands, says Marcelino Aranibar, an animal nutritionist and vice president of research at the National University of Juliaca. Especially at higher altitudes, these hardy and frost-resistant varieties are a valuable food source. Instead of detoxifying them with clay alone, Aranibar says these bitter potatoes are often made into chuño, a form of naturally dehydrated potato that also removes some of the toxins. Making chuño is considered an ancient Andean practice and allows for year-round potato storage. Some Peruvian scientists think that the same characteristics that allow the clay to stick to potato toxins give it therapeutic properties as well. Throughout Peru, chaco is now sold as an alleged treatment for stomach problems ranging from indigestion to ulcers. Aranibar has researched how rats with gastritis recuperate after being fed chaco, though he has not researched this in humans. Aranibar himself eats the pale tan or grey clay mixed with water once every day or two. He claims it has helped manage his own gastritis. 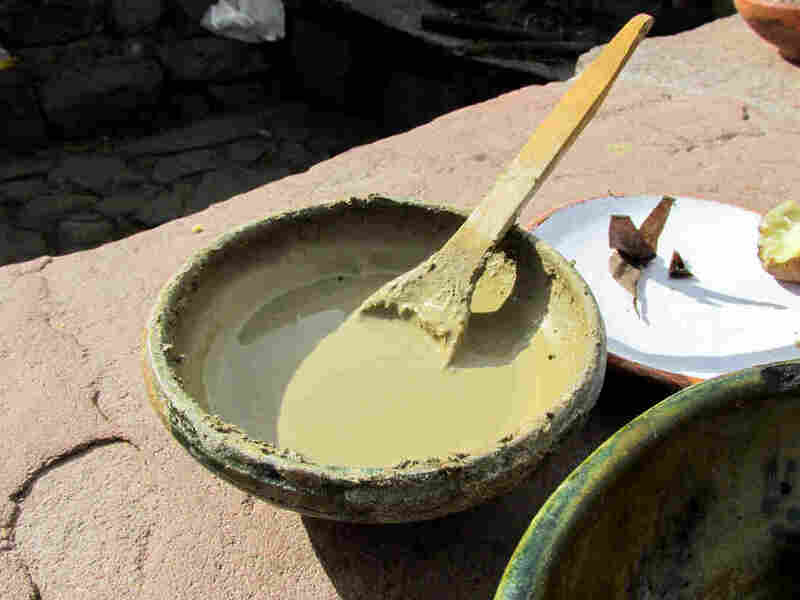 The practice of clay eating is now a part of the region's tradition, says Aranibar. "There are many people in the Peruvian-Bolivian high plateau that still consume clay, but it's not because the potatoes are bitter," he says. "It is more of a custom than a necessity." Megan Jula is a journalist based in Washington D.C. She writes about health and science.